So bright and full of warmth, this sunny bouquet is a sure thing when it comes to making someone you care about smile. 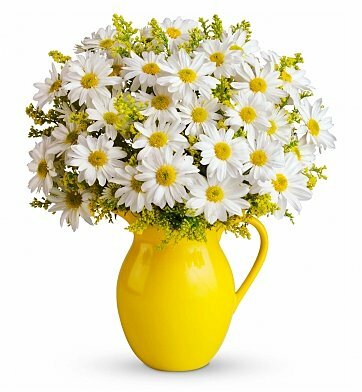 A handled pitcher holds a dazzling bouquet of daisy spray chrysanthemums accented with solidago. With its fresh appeal and keepsake pitcher, the arrangement is a beautiful gift for any spring occasion or just because. Measures approximately 15" x 17". Sunny Day Pitcher of Daisies is a hand delivered gift. These gifts are delivered by one of our local design centers located throughout the United States and Canada. Same day delivery is available for most gifts when ordered before the cutoff time. The cutoff time for Sunny Day Pitcher of Daisies is 2 PM in the recipient's time zone. Entire experience was quick and efficient with tremendous selection to choose from. Delivered promptly. Completely satisfied! Recipient was absolutely delighted with these daisies, her favorite flower. When the local florist had already delivered to the hospital that day, they upgraded my order at no extra charge. Awesome customer service, and I'll certainly be using you again. Sunny Day Pitcher of Daises really brightened the recipient's day. The flowers were delivered exactly when expected. My wife called and said they were beautiful and even loved the pitcher the flowers came in. Great Job, beautiful flowers and fair price. We gave this as a Birthday Gift and we sent it to my sister who turned 60 and she said they were GORGEOUS. I highly recommend this Pitcher of Daisies. Flowers arrived on time. They were not exactly those shown in the picture but I assume it depends on the season. However, the whole effect was lovely, yellow roses were an unexpected addition and my husband loved the bouquet and thought the jug fabulous. I would definitely use this florist again. For my Girlfriend who was really happy with them! These daisies looked so English, & because my granddaughter loved making daisy chains here, I was pleased that Gift Tree confirmed that the presentation would be just as photographed. I sent them from England to California. Unfortunately, problems arose with the delivery! The recipients were out, but the delivery man phoned my son,who told him to hide them in a certain place. However, upon returning, the flowers had vanished. I understand my son phoned to confirm the delivery had been left where instructed, and although this had been done, you offered, very generously, to send a replacement. That was most kind, and my granddaughter was not disappointed. All in all, the flowers were a great success, and my granddaughter, (celebrating her birthday with her leg in a cast) was thrilled to bits ??? even though she is now only 3!! Thank you for that excellent service, for sorting it out and I am sorry there were difficulties. I hope the thief enjoyed the flowers as well... shame on them! First of all, the recipient loved the flowers and she said they made her day, so for that I'm really happy. Delivery was really quick. But while the end result was still a nice arrangement, instead of the yellow pitcher shown in the picture, the pitcher was green with white and yellow daisies painted on it. And there were some random purple flowers in the arrangement that didn't quite blend... but like I said, it made my friend very happy, and that's the important thing.